Born in Scranton, Pennsylvania, in 1938, Hopkins grew up in a poor but close family. At age ten, his family moved in with other relatives to make ends meet, and he spent most of his youth in Newark, New Jersey. The oldest child in the family, Hopkins had to help out with the family finances, often missing school so he could work. Though the family was able to get on its feet again and rent a basement apartment, relations soon deteriorated between Hopkins’s parents, leading to separation. The circumstances of his youth would later play a prominent part in his fiction writing for young adults. After graduating from high school, Hopkins was determined that he would become a teacher. To pay his way through Newark State Teacher’s College a teacher’s training college which later became Kean University, he worked several jobs. Taking a job in Fair Lawn, NJ, a suburban, middle-class school district, he taught sixth grade for three years after which he became the resource teacher, gathering and organizing materials for the other teachers. It was during this time he came up with using poetry as an aid in reading. However, it quickly became apparent to him that poetry could be expanded to introduce all subject areas. In the late 1960s, after receiving his Masters of Science degree at Bank Street College of Education in NYC, he became consultant at Bank Street, where he again used poetry as a learning tool. 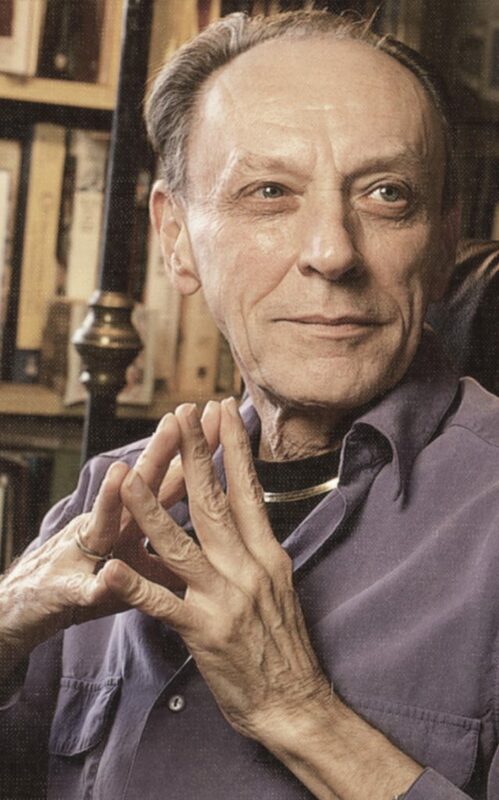 In 1968 he became an editor at Scholastic, a post he held until 1976 when he became a full-time writer and anthologist. Hopkins’s original poetry has won high praise; a reviewer for Publishers Weekly noted that “Hopkins brings freshness and immediacy to his subjects” and “deftly depicts a sense of delight and wonder in everyday experience.” Been to Yesterdays: Poems of Life is a gathering of poems that look at the psychology of Hopkins at age thirteen, when his parents separated. “This autobiographical cycle of poems is a rare gift, a careful exploration of one life that illumines the lives of all who read it,” wrote Kathleen Whalin in School Library Journal. The National Council of Teachers of English Excellence in Poetry for Children Award, 2010. National Trustee for the National Center for Children’s Illustrated Literature, Austin, TX. University of Southern Mississippi Medallion for “lifetime contributions to Children’s Literature. In addition, Hopkins’ books received a host of honors including five ALA Notable Books. Books Are by People, Citation Press, 1969. Let Them Be Themselves: Language Arts Enrichment for Disadvantaged Children in Elementary Schools, Citation Press 1969, second edition published as Let Them Be Themselves: Language Arts for Children in Elementary Schools, 1974, third edition, Harper, 1992. Pass the Poetry, Please! 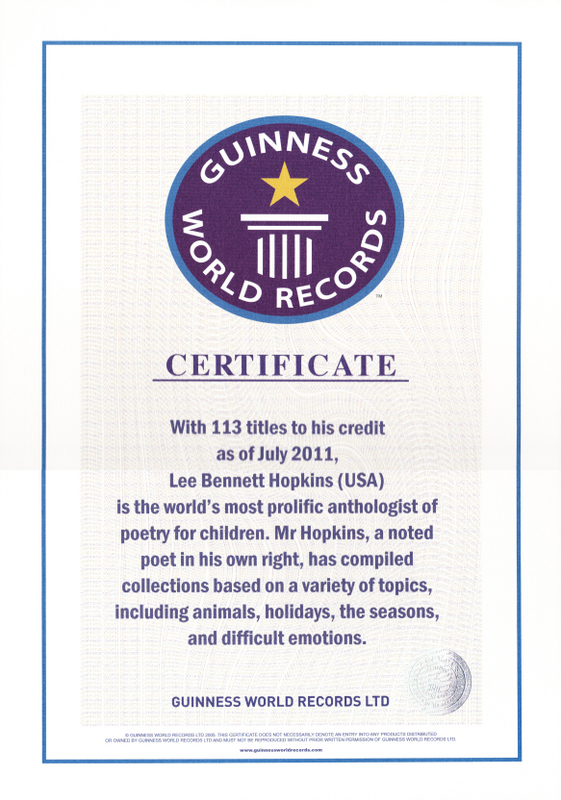 : Bringing Poetry into the Minds and Hearts of Children, Citation Press 1972, third revised edition, HarperCollins, 1998. More Books by More People, Citation Press,1974. Pauses: Autobiographical Reflections on 101 Creators of Children’s Books, HarperCollins. 1995. Mama, Dell 1977, reprinted, Boyds Mills Press, 2000. Mama and Her Boys, Harper, 1981, reprinted, Boyds Mills Press, 2000. Important Dates in Afro-American History, F. Watts.1969. This Street’s for Me (poetry), Ilus. by Ann Grifalconi, Crown, 1970. Charlie’s World: A Book of Poems, Ilus. by Charles Robinson, Bobbs-Merrill, 1972. Kim’s Place and Other Poems,Ilus. by Lawrence DiFiori, Holt, 1974. I Loved Rose Ann, Ilus. by Ingrid Fetz, Knopf , 1976. The Writing Bug: An Autobiography. Richard C. Owen, 1994. Good Rhymes, Good Times!, Ilus. by Frane Lessac, HarperCollins, 1995. Alphathoughts: Alphabet Poems, Ilus.by Marla Baggetta, Boyds Mills Press/Wordsong, 2003. City I Love. Ilus. by Marcellus Hall. Abrams, 2010. Full Moon and Star. Ilus. by Marcellus Hall. Abrams, 2011. Mary’s Song, Ilus. by Stephen Alcorn. Eerdmans, 2013. I Think I Saw a Snail: Young Poems for City Seasons, Ilus. by Harold James, Crown, 1969. Don’t You Turn Back: Poems by Langston Hughes, Ilus. by Ann Grifalconi, foreword by Arna Bontemps, Knopf (New York, NY), 1969. City Talk, Ilus. by Roy Arnella, Knopf, 1970. Faces and Places: Poems for You, Ilus. by Lisl Weil, Scholastic 1970. (with Misha Arenstein). The City Spreads Its Wings, Illus. by Moneta Barnett, Franklin Watts, 1970. Me! : A Book of Poems, Illus.by Talavaldis Stubis, Seabury, 1970. Zoo! : A Book of Poems, Illus. by Robert Frankenberg, Crown, 1971. Girls Can Too! : A Book of Poems, Illus. by Emily McCully, Franklin Watts, 1972. Happy Birthday to Me!, Scholastic 1972. When I Am All Alone: A Book of Poems, Scholastic, 1972. On Our Way: Poems of Pride and Love, Ilus. by David Parks, Knopf ,1974. Hey-How for Halloween, Ilus. by Janet McCaffery, Harcourt, 1974. Take Hold! : An Anthology of Pulitzer Prize-Winning Poems, Thomas Nelson, 1974. Poetry on Wheels, Ilus. by Frank Aloise, Garrard, 1974. A Haunting We Will Go: Ghostly Stories and Poems, Ilus. by Vera Rosenberry, Albert Whitman, 1976. Witching Time: Mischievous Stories and Poems, Ilus. by Vera Rosenberry, Albert Whitman, 1976. Merrily Comes Our Harvest In, Ilus.by Ben Shecter, Harcourt, 1976. Beat the Drum! Independence Day Has Come, Ilus. by Tomie de Paola, Harcourt, 1977. Monsters, Ghoulies, and Creepy Creatures: Fantastic Stories and Poems, Ilus. by Vera Rosenberry, Albert Whitman. 1977. To Look at Any Thing, Illus. by John Earl, Harcourt, 1978. Pups, Dogs, Foxes, and Wolves: Stories, Poems, and Verse, Illus. by Vera Rosenberry, Albert Whitman, 1979. Kits, Cats, Lions, and Tigers: Stories, Poems, and Verse, Ilus. by Vera Rosenberry, Albert Whitman, 1979. Go to Bed: A Book of Bedtime Poems, Illus. by Rosekranz Hoffman, Knopf, l979. Easter Buds Are Springing: Poems for Easter, Illus. by Tomie de Paola, Harcourt,1979. Merely Players: An Anthology of Life Poems, Thomas Nelson .1979. My Mane Catches the Wind: Poems about Horses, Ilus. by Sam Savitt, Harcourt,1979. By Myself, Ilus. by Glo Coalson, Crowell, 1980. Elves, Fairies, and Gnomes, Ilus. by Rosekranz Hoffman, Knopf, 1980. Moments: Poems about the Seasons, Ilus. by Michael Hague, Harcourt, 1980. Morning, Noon, and Nighttime, Too!, Ilus. by Nancy Hannans, Harper,1980. I Am the Cat, Ilus. by Linda Rochester Richards, Harcourt, 1981. And God Bless Me: Prayers, Lullabies and Dream-Poems, Ilus. by Patricia Henderson Lincoln, Knopf, 1982. Circus! Circus!, Ilus. by John O’Brien, Knopf, 1982. Rainbows Are Made: Poems by Carl Sandburg, Ilus. by Fritz Eichenberg, Harcourt, 1982. A Dog’s Life, Ilus. by Linda Rochester Richards, Harcourt, 1983. How Do You Make an Elephant Float?, and Other Delicious Food Riddles, Ilus.. by Rosekranz Hoffman, Albert Whitman,1983. Animals from Mother Goose, Ilus..by Kathryn Hewitt, Harcourt, 1989. People from Mother Goose, Ilus. by Kathryn Hewitt, Harcourt, 1989. The Sky Is Full of Song, Ilus. by Dirk Zimmer, Harper. 1983. A Song in Stone: City Poems, Ilus. by Anna Held Audette, Crowell, 1983. Crickets and Bullfrogs and Whispers of Thunder: Poems and Pictures by Harry Behn, Harcourt, 1984. Love and Kisses, Ilus. by Kris Boyd, Houghton, 1984. Surprises: An I-Can-Read Book of Poems, Ilus. by Meagan Lloyd, Harperl,1984. Creatures, Ilus. by Stella Ormai, Harcourt. 1985. Munching: Poems about Eating, Ilus. by Nelle Davis, Little, Brown,1985. Best Friends, Ilus. by James Watts, Harper, 1986. The Sea Is Calling Me, Ilus. by Walter Gaffney-Kessel, Harcourt, 1986. Click, Rumble, Roar: Poems about Machines, Ilus. by Anna Held Audette, Crowell, 1987. Dinosaurs, Ilus. by Murray Tinkelman, Harcourt, 1987. More Surprises: An I-Can-Read Book, Ilus. by Meagan Lloyd, Harper, 1987. Voyages: Poems by Walt Whitman, Ilus. by Charles Mikolaycak, Harcourt, 1988. Side by Side: Poems to Read Together, Ilus. by Hilary Knight, Simon & Schuster, 1988. Still as a Star: Nighttime Poems, Ilus. by Karen Malone, Little, Brown, 1988. Good Books, Good Times!, Ilus. by Harvey Stevenson, Harper , 1990. On the Farm, Ilus. by Laurel Molk, Little, Brown,1991. Happy Birthday, IIus. by Hilary Knight, Simon & Schuster ,1991. Questions: An I-Can-Read Book, Ilus. by Carolyn Croll, HarperCollins,1992. Through Our Eyes: Poems and Pictures about Growing Up, Ilus. by Jeffrey Dunn, Little, Brown,1992. To the Zoo: Animal Poems, Ilus. by John Wallner, Little, Brown, 1992. Ring out, Wild Bells: Poems of Holidays and Seasons, Ilus. by Karen Baumann, Harcourt, 1992. Pterodactyls and Pizza: A Trumpet Club Book of Poetry, Ilus. by Nadine Bernard Westcott, Trumpet Club, 1992. Flit, Flutter, Fly! : Poems about Bugs and Other Crawly Creatures, Ilus. by Peter Palagonia, Doubleday, 1992. Ragged Shadows: Poems of Halloween Night, Ilus. by Giles Laroche, Little, Brown,1993. Extra Innings: Baseball Poems, Ilus.by Scott Medlock, Harcourt 1993. It’s about Time,, Ilus. by Matt Novak, Simon & Schuster,1993. Hand in Hand: An American History through Poetry, Ilus. by Peter Fiore, Simon & Schuster, 1994. April, Bubbles, Chocolate: An ABC of Poetry, Ilus. by Barry Root, Simon & Schuster, 1994. Weather: An I-Can-Read Book, Ilus. by Melanie Hill, HarperCollins,1994. Blast Off: Poems about Space: An I-Can-Read Book, Ilus. by Melissa Sweet, HarperCollins.1995. Small Talk: A Book of Short Poems, Ilus. by Susan Gaber, Harcourt, 1995. School Supplies, Ills.by Renee Flower, Simon & Schuster,1996. Opening Days: Sports Poems, Ilus.by Scott Medlock, Harcourt, 1996. Marvelous Math: A Book of Poems, Ilus. by Karen Barbour, Simon & Schuster,1997. Song and Dance, Illus. by Cheryl Munro Taylor, Simon & Schuster, 1997. All God’s Children: A Book of Prayers, Ills. by Amanda Schaffer, Harcourt Brace, 1998. Climb into My Lap: First Poems to Read Together, Ilus. by Kathryn Brown, Simon & Schuster,1998. Dino-Roars, Ilus. by Cynthia Fisher, Golden Books, 1999. Lives: Poems about Famous Americans, Ilus. by Leslie Staub, HarperCollins,1999. Spectacular Science: A Book of Poems, Ills. by Virginia Halstead, Simon & Schuster, 1999. Sports! Sports! Sports! : An I-Can-Read Book, Ilus. by Brian Floca, HarperCollins, 1999. My America: A Poetry Atlas of the United States, Ilus. by Stephen Alcorn, Simon & Schuster, 2000. Yummy! : Eating through a Day, Ilus. by Renee Flower, Simon & Schuster, 2000. Hoofbeats, Claws & Rippled Fins: Creature Poems, Ilus. by Stephen Alcorn, HarperCollins, 2002. Home to Me: Poems across America, Ills. by Stephen Alcorn, Orchard, 2002. A Pet for Me:An I-Can-Read-Book, lIus. by Jane Manning, HarperCollins, 2003. Wonderful Words: Poems about Reading, Writing, Speaking, and Listening, Ills. by Karen Barbour, Simon & Schuster, 2004. Hanukkah Lights: Holiday Poetry, Ilus. by Melanie Hall, HarperCollins, 2004. Christmas Presents: Holiday Poetry, Ilus. by Melanie Hall, HarperCollins, 2004. Days to Celebrate: A Full Year of Poetry, People, Holidays, History, Fascinating Facts, and More, Ilus. by Stephen Alcorn, Greenwillow, 2005. Valentine Hearts: Holiday Poetry, Ilus.by JoAnn Adinolfi, HarperCollins, 2005. Oh, No! Where Are My Pants?, and Other Disasters: Poems, Ilus. by Wolf Erlbruch, HarperCollins, 2005. Halloween Howls: Holiday Poetry, Ills. by Stacey Schuett, HarperCollins, 2005. Got Geography!, Illus. by Philip Stanton, Greenwillow, 2006. Behind the Museum Door: Poems to Celebrate the Wonders of Museums, Illus. by Stacey Dressen-McQueen, Abrams, 2007. Hamsters, Shells, and Spelling Bees: School Poems, Illus.by Sachiko Yoshikawa, HarperCollins, 2008. America at War, Ilus. by Stephen Alcorn. McElderry,2008. Sky Magic, Ilus. by Mariusz Stawaski, Dutton, 2009. Incredible Inventions, Ilus. by Julia Sarcone Roach,Greenwillow,2009. Sharing The Seasons, Ilus. by David Diaz. McElderry, 2010. Amazing Faces, Ilus. by Chris Soentpiet.Lee & Low, 2010. All The World’s A Stage, Ilus. by Guy Billout. Creative Editions, 2013. Manger, Ilus. by Helen Cann. Eerdmans, 2014. Amazing Places. Illus. by Chris Soentpiet and Christ Hale. Lee & Low Books, 2015. Traveling the Blue Road: Poems of the Seau. Illus. by Bob and Jovann Hansman. Quarto/Sea Grass Press, 2017. School People: A Book of Poems. Illus. by Ellen Shi. WordSong, 2018. World Make Way: New Poems Inspired by Art from the Metropolitan Museum of Art. Harry N. Abrams, 2018. A Bunch of Punctuation. Ills. by Serge Bloch. WordSong, 2018. I Remember: Poems and Pictures of Heritage. Lee & Low Books, 2019. I Am Someone Else: A Book of Poems. Illus. by Chris Hsu. Charlesbridge, 2019.